All of our 2009 fawns were released about a week ago. They are living in our forest, browsing the woodland and coming to the bottle rack each evening. Little by little they are becoming independent, soon to become part of the local herd, wild and free. Today we received another fawn, delivered to us by WCO Dan Lynch, a Wildlife Conservation Officer with the Pennsylvania Game Commission. This is really not news. The PGC has been bringing us fawns since we began our deer rehabilitation program several years ago. They also refer many people with fawn that need help or have questions relating to fawns. I would not even make special mention of this except that there is currently a campaign going on saying that the PGC does not allow fawn rehabilitation at all. That’s news to me since we have been rehabilitating fawns for 6 years and are licensed by the PGC. Red Creek learned of this campaign recently after a call from a Lancaster newspaper where we were quoted. To read the absurd story please visit LancasterOnline. So here it is folks. 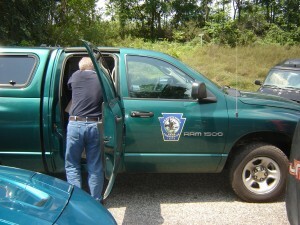 Pictures of WCO Dan Lynch delivering an injured fawn to Red Creek. The fawn is now under observation and resting comfortably. I will let you know how the little one fares out. Only you can guess what the fawn may be thinking.